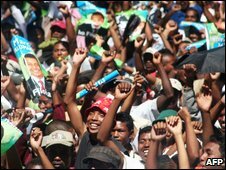 Thirty-four people have been injured - some from gun shots - at an anti-government rally in Madagascar. About 15,000 protesters demanding the return of President Marc Ravalomanana, who was ousted last month, clashed with police in the capital, Antananarivo. Tear gas was used against demonstrators who turned out in record numbers to protest for a sixth consecutive day against new leader Andry Rajoelina. In a recorded message, Mr Ravalomanana promised he would return soon. The deposed leader, who fled after he was toppled on 17 March, is in Swaziland ahead of Monday's meeting by regional leaders to discuss possible sanctions against Madagascar. Mr Ravalomanana urged supporters in a speech broadcast on private media: "Keep going, consolidate your movement so that the entire world can know that we won't stop until the rule of law is re-established," reported AP news agency. "I beseech you not to accept the repression that certain people want to impose, the division they want to create. We must show our unity, our solidarity." Earlier on Saturday protesters tried to reach government offices now occupied by supporters of Mr Rajoelina, the former opposition leader. They have called for a general strike to start on Monday. The BBC's Jonny Hogg in Antananarivo says it remains unclear whether the security forces were shooting in the air or at the protesters themselves. The gunfire came from various different points within the centre of the capital, our correspondent adds. The Ravoahangy Andrianavalona Hospital said in a statement that 34 people had been injured, including two children aged 12 and 14, although 21 had already been discharged. Mr Rajoelina's military-backed government has offered reconciliation talks early next month with allies of Mr Ravalomanana. But members of the ousted leader's political party have not confirmed whether they would join the proposed dialogue. The new government has come under increasing pressure from the daily protests and a growing international backlash against Mr Rajoelina's rise to power. The African Union has already announced Madagascar's suspension, while the United States and European Union have described Mr Rajoelina's accession as a coup. 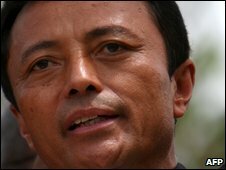 Mr Ravalomanana, 59, resigned after weeks of often violent street protests - led by his rival - in which around 100 civilians died. Mr Rajoelina, who spent nearly two years as Antananarivo mayor, is Africa's youngest president. Still six years too young to be president under the current constitution, he has promised new elections within two years after a new charter is adopted, but this has failed to satisfy donors.